Note: Don't forget to change the default passwords when you configure user accounts (see 13. Create user accounts). Minutes of Real-time Data The number of minutes to keep full detailed traffic data. 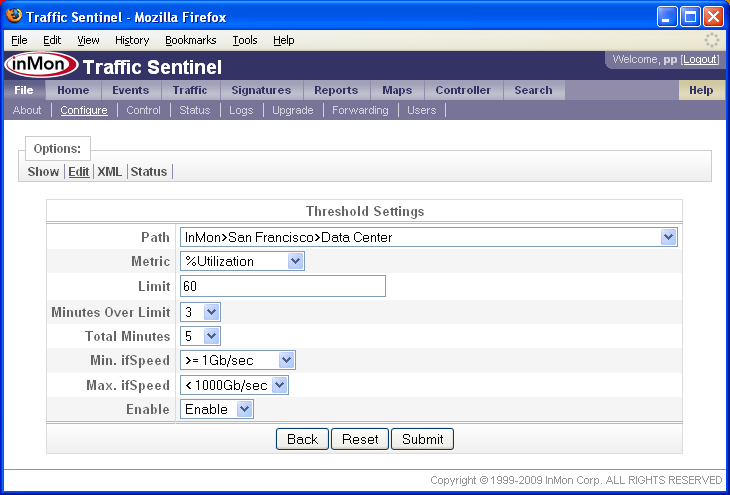 Traffic Sentinel collects host performance metrics using the sFlow standard. Hosts must be configured to send sFlow to the Traffic Sentinel server on UDP port 6343. The following chart shows the overall performance of a cluster of 1,000 servers. 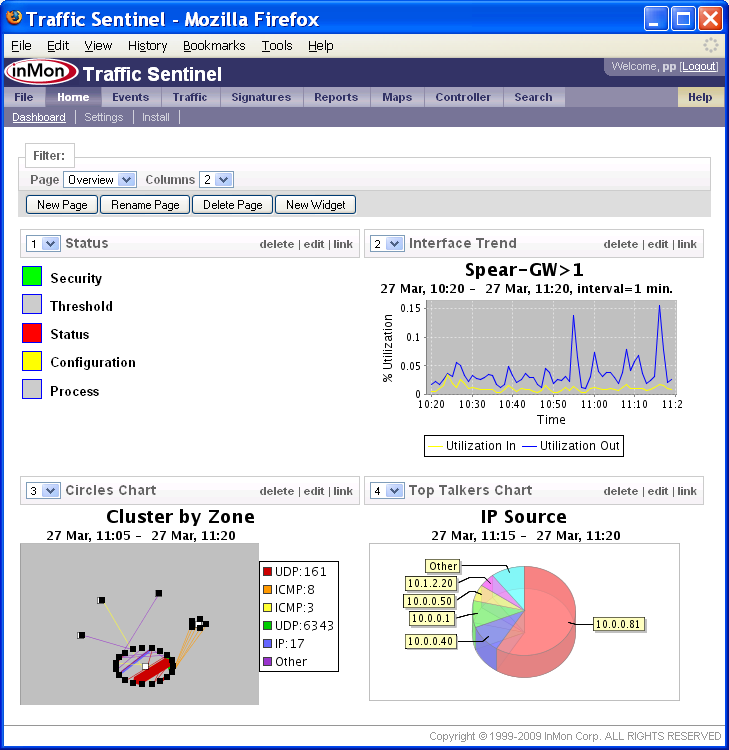 The Host Performance tutorial describes the host performance monitoring capabilities of Traffic Sentinel in detail. Traffic Sentinel collects application performance metrics, including response times and error rates, using the sFlow standard. Applications supporting sFlow monitoring will automatically pick up host configuration settings, see 2. Configure hosts. The Application Performance tutorial describes the application performance monitoring capabilities of Traffic Sentinel in detail. sFlow® sFlow can be configured using SNMP or through the switch CLI. However, the mechanisms that are available will depend on the switch vendor. If your vendor supports the sFlow MIB, you will need to make sure that Traffic Sentinel is allowed SNMP read/write access. If you are configuring sFlow through the switch CLI then you will need to consult your switch vendors documentation for the settings. The following FAQ entries describe typical configuration settings: How do I configure sFlow on my Brocade switch?, How do I configure sFlow on my Force10 switch?, How do I configure sFlow on my Extreme Networks switch?, How do I configure sFlow on my Hewlett-Packard ProCurve switch?, How do I configure sFlow on my Juniper switch? and How do I configure sFlow on my Alcatel-Lucent OmniSwitch? Traffic Sentinel will automatically "discover" devices when it receives sFlow, NetFlow, JFlow or IPFIX data (Note: you would have had to configure the switches to send data to Traffic Sentinel - see 4. Configure switches). If all your devices fall into this category you can skip to section 5.2 Agents. If you have devices that can only be monitored using SNMP or devices that are going to be configured using SNMP (e.g. sFlow devices supporting the sFlow MIB), then you will need configure Traffic Sentinel's discovery settings before these devices will be discovered. See 5.1 Agent Range below. The File>Configure>Status page shows all the agents that have been discovered and their place in the configuration tree. Section 7. Define administrative groupings describes the rules for locating an agent in the configuration tree. In this example, there are 6 switches located with Zone and Group "Other", indicating that we haven't yet organized the network into Zones and Groups (see 7. Define administrative groupings). The top level view shows the Zones that contain Groups of switches (see 7. Define administrative groupings). In this case click on the default zone name "Zone 1". The File>Configure>Edit page is used to define zones and groups. In the following example we will be building the zones and groups for the network described in the 7.1.1 University example. The Edit Zones form allows zones to be added, removed or modified. Note that there are two zones defined already, the first is the default zone, Zone 1, created when Traffic Sentinel is first started. The second, Multicast is used to capture IP multicast addresses (see 8. List address space to see how IP addresses can be grouped). Simply enter the name of a zone, in this case "Core" and click on the Submit button to create the zone. Repeat these steps to add all the zones, in this example the zones are "Core", "Departments" and "Accommodation". Now that the zones have been defined, it is time to add the groups. Repeat this process until all the groups have been added to the remaining zones. The File>Configure>Edit page is used to assign CIDRs to groups. In the following example we will add a CIDR from the University example above (see 7. Define administrative groupings for instructions on creating the "Unassigned" zone and group). Note: The 10.0.0.91/24 CIDR in the Zone 1 zone and Group 1 group was added by default in the initial Traffic Sentinel configuration file. This is simply the subnet that Traffic Sentinel resides on and it can be removed by clicking on the Remove button in the table. Note: In this case the switch appears in the Group 1 group while a host connected to it appears in the Admin group. The switch location is determined using the rules in 9. Assigning agents to groups while traffic associated with host addresses is grouped by CIDR. While it often makes sense to group hosts and switches together, you may have situations where this isn't possible or doesn't make sense. It can be useful to organize switches geographically (e.g. Building A, 2nd Floor) while classifying network traffic by corporate function (e.g. Manufacturing, Sales, Support). In section 5.1 Agent Range you may have defined Agent Range settings in order to discover the switches. In this case you will be using Agent Range and Agent settings to assign agents to groups. Alternatively, if you haven't been using Agent Ranges, you may want to use CIDRs to group agents. In either this case, it is worth reading 8. List address space before proceeding because CIDRs are used for classifying traffic flows (allocating source and destination IP addresses to groups) as well as for assigned agents to groups. Often the overlap between the two functions is desirable (you want to put the switch in the same group as hosts), but there may be situations where you would like assign the switch to a different group without disturbing the address space groupings. Since Agent Range and Agent settings have a higher priority than CIDR settings, they can be used to move an agent while leaving the address groups undisturbed. In section 5.2 Agents we used the File>Configure>Status page to show where "agents" have been placed in the configuration tree. Traffic Sentinel has a number of capabilities targeted at identifying security threats to the network. The tutorial, Managing Network Security, describes the steps needed to configure security monitoring. Traffic Sentinel traffic controller that can be used to identify hosts that are using excessive bandwidth and take action to maintain quality of service. The tutorial, Enforcing Usage Quotas, describes the steps needed to configure the controller.